An introduction to the current analytical methods and equipment used for the study of the high-purity gases employed by the semiconductor and other related industries. The information available in this title becomes important as the semiconductor industry continues to move towards gas-phase reagents and the need for greater purity. Individuals dealing with the manufacturing of these devices needs to understand the technology available for modern gas analysis and quality control. 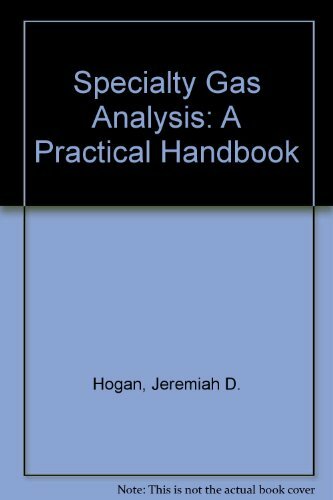 This text includes a brief history of related forms of gas analysis, guidelines for performing gas analysis, and the knowledge needed to best perform required evaluations of gas systems and procedures. This is the first book to provide an introduction to current analytical methods and equipment for the analysis of high-purity gases used in the semiconductor industry and related fields. It will help researchers familiarize themselves with the methods and technology in this field, and help newcomers get up to speed in a reasonable time. In addition, it will assist those in the semiconductor industry who are not analysts, but who can benefit from understanding what gases can be analyzed, what contaminants can be detected, and what problems are involved in performing these type of analyses.